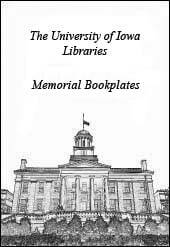 Digital memorial bookplates provide a means for the University of Iowa Staff Council to memorialize UI staff members who have passed away while employed at the University. University of Iowa Libraries donor bookplates recognize those who have provided gifts in support of building and expanding library collections. In both instances the Libraries’ digital bookplating program inserts a permanent link into the title’s online catalog record that points back to the digital bookplate.